Our Prehistoric Room, located on the 2nd floor of the museum, contains over 1,000 artifacts representing all prehistoric eras from Paleoindian to Late Prehistoric. Our prehistoric artifacts are organized in chronological order by type of artifact, along with a timeline showing and explaining how people during that time lived and used the associated artifacts. People during the Paleoindian time period were mobile and lived in small groups of 30-40 people. They occupied small temporary camps while hunting various animals with spears tipped with flint points. We have numerous artifacts from this era including various types of spear points and knives, and several mastodon bones. Archaic people depending on hunting, fishing, and collecting plant food and started to live in more permanent settlements with larger groups of people. 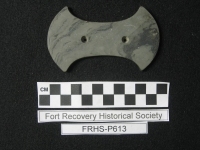 Their tools included a large variety of spear points, knives, and groundstone artifacts used to process food. Late Archaic cultures placed a growing emphasis on trade, symbolism and ceremonialism and their artifacts reflect this. Our collection contains a vast number of Archaic artifacts including numerous types of spear points, knives, axes, pestles, and grinding stones. Of special significance is our Late Archaic Glacial Kame collection which includes copper and shell beads, sandal sole shell gorgets, bannerstones, and other rare artifacts that reflect the Glacial Kame people's ceremonialism and trade networks. The Woodland period saw an increased dependence on the cultivation of corn, beans and squash, allowing larger settlements over a longer period of time. Pottery came into use as a way to store and cook food. Woodland cultures include Adena and Hopewell, both building mounds and earthworks for burial and ceremonial purposes. Artifacts were created out of exotic materials, not native to Ohio, furthering trade networks far outside of Ohio. The actual bow and arrow was developed during the Late Woodland period. Our Woodland artifacts consist mostly of points and arrowheads, plus a few other artifacts from the Adena and Hopewell cultures. Also known as Mississippian or Protohistoric, people in the Late Prehistoric lived in villages located in areas of fertile soil - although they periodically moved when land fertility and other natural resources declined. They hunted with bows and arrows, fished, collected wild plants, and also continued to cultivated corns, beans and squash. Pottery was used extensively and different groups made and decorated their pottery in different ways. Our collection contains Late Prehistoric spear points, knives, and arrowheads.